You need a list of all fret distances (related to the nut) before you start designing your guitar. 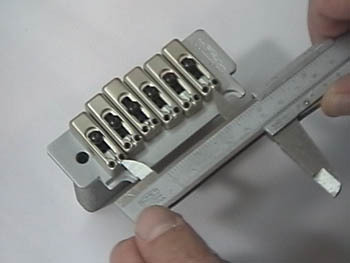 Start by drawing a line in the middle of a sheet of paper and mark the scale length (24.75" / 628.65mm) and both the front edge of the nut at the top and the point at which the strings rest on the saddles at the bottom with a short line. The next thing to decide on is the string spread. If you do not have any specific string spread in mind, take 35mm (1-3/8") at the nut (A) for your acoustic or electric guitar. This distance is the distance between the center line of the two outer strings. The string spread (B) of this bridge (a Wilkinson/Gotoh tremolo) is fixed. Mark the string spread and the two outer strings at the nut (A) and at the bridge (B). Then draw the other strings at equal distances between them. The distances between the individual strings (a, b) can be worked out easily by dividing the nut width A and the bridge width B by 5 (a = A/5, b= B/5). To prevent the outer strings from gliding over the fingerboard edge during playing a minimum distance to the edges has to be kept: about 3.5mm (1/8") on either side is sufficient. The neck of a guitar with a string spread of 35mm (1-3/8") at the nut will therefore be 42mm (1-5/8") wide at the nut (35mm + 3.5mm + 3.5mm / 1-3/8" + 1/8" + 1/8"), which is a standard nut width. If the guitar is to have 22 frets mark the distance from the nut to the 23rd fret: this is roughly where the fingerboard ends. Now draw the fingerboard outline parallel to the outer strings.